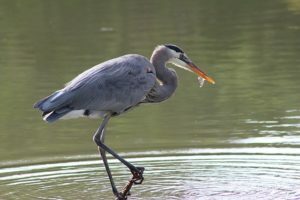 One of the many creatures you are sure to encounter on St. Simons Island is the Great Blue Heron. A Golden Isles treasure and a beautiful example of nature at her finest, this giant bird stands up to 39 inches high and is an illustrious predator. Often, these magnificent birds can be seen on the banks of lagoons either fishing or warming themselves in the sun. The Great Blue Heron is a master fisherman and uses its long, colored toes to entice fish. When prey ventures too close, the heron uses its razor-sharp beak to strike with deadly accuracy and rarely misses its quarry. While you are bound to see a variety of other birds out on the water, the Great Blue Heron is a special treat. 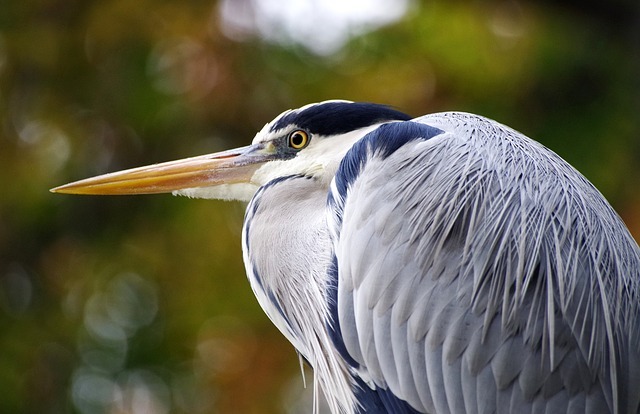 The Great Blue Heron is one of the largest birds in the heron species, with a range encompassing all of North America and some of Central and South America. They mate and nest from December through March, so this time of year is the perfect opportunity to see one. Their diet consists mostly of fish; however, they have been seen eating eels, snakes and frogs as well. The Great Blue Herons are indigenous to St. Simon’s Island and live here year-round. They are an integral part of our area’s ecosystem and exciting for families and guests to witness while visiting the area. Many other birds share the preserve with Great Blue Herons, including Egrets, Storks, Night Herons, Green Herons, Ospreys, Bald Eagles and more. However, the sighting of a Great Blue Heron is sure to be an unforgettable encounter for all who experience it.